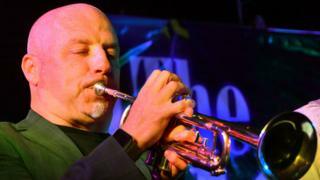 Image caption Trumpeter John Thirkell: "I could not have started this journey without free music lessons in school." The report suggests only 19% of children from families earning less than Â£28,000 learned a musical instrument, compared with 40% of those in high-earning households. Children from poorer backgrounds who did learn an instrument were found to be half as likely to receive private lessons, with almost double the number saying they were self-taught, compared to their more affluent peers in households earning more than Â£48,000. In response, a Department for Education spokesperson said: "The department has invested Â£300m in music hubs between 2016-2020, to give every child the chance to learn an instrument without any cost to them or their families. "Just last month, analysis showed that through music hubs over 700,000 children learnt to play instruments in class together last year." The department also pointed out that music education is compulsory up to the age of 14 in the national curriculum. Thirkell said: "I could not have started this journey without free music lessons in school. My parents worked hard to put food on our table, so there is no way that my parents could have afforded to help with my tuition. "When you teach a child to play an instrument, you are teaching them a whole range of critical life skills which you learn along the way. It requires dedication, organisation and persistence; it is mathematical; you learn how to fit into a group. There is so much more than meets the eye." The MU is calling on the government to address the disparity between access to musical tuition. Horace Tr ubridge, general secretary at the MU, said: "With certain children priced out of learning musical instruments, we may well only be hearing the songs and sounds of the affluent in years to come. "Those from poorer backgrounds will, unfairly, be increasingly under-represented within the industry." The MU says since the removal of arts subjects from the EBacc, together with increased Ofsted focus on STEM subjects, music has been "downgraded" as a subject. "This has led to a reduced respect for music from some local authorities and schools and therefore a disincentive to provide decent music opportunities," the union said in a statement. Thirkell added: "The amount of revenue that the music industry generates in the UK is huge. If the government is too blind to support the ambitions of young children, they shouldn't overlook the huge opportunity for investment behind keeping music on the school syllabus." UK Music last week reported a record year for British music revenues in 2017 - with the music industry contributing Â£4.5bn to the UK economy last year.